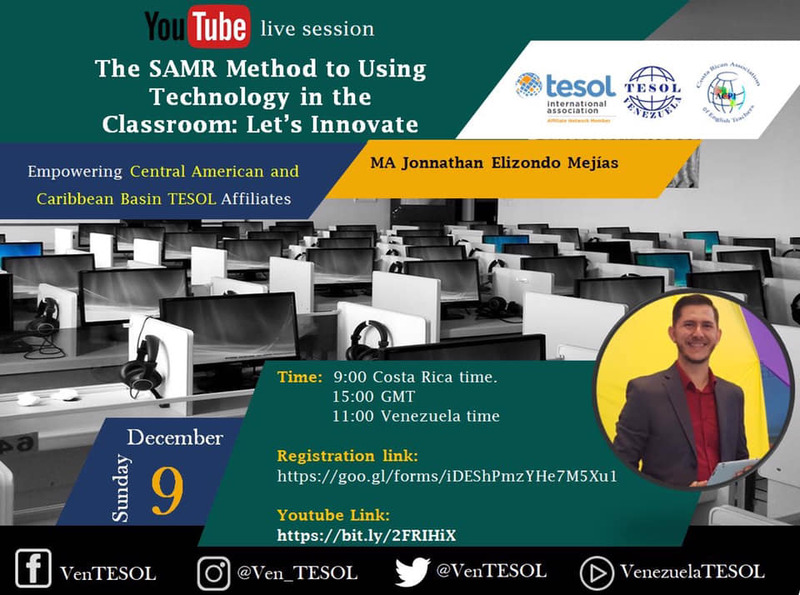 Venezuela TESOL (VenTESOL) and the Central American and Caribbean Basin TESOL Affiliates cordially invite you to the “The SAMR Method to Using Technology in the Classroom: Let’s Innovate” Youtube live session. How many of us have struggled trying to incorporate technology into our classes? How much time have we invested trying to use the appropriate technology either to plan our activities or to get students to use it? As teachers, we are afraid of using ICTs because we think we don’t have the resources or we don’t know how to use them correctly. Truth is, there is no way back… Technology is second nature to our GenX and GenY students, the world today is shaped around technology and educational institutions have incorporated technology in the curricula. Dr. Puentedura provides us with the SAMR method to implement technology in the classroom because by using technology we are empowering our students to take responsibility for their own learning and promoting independent learners who can successfully navigate in the 21st Century. 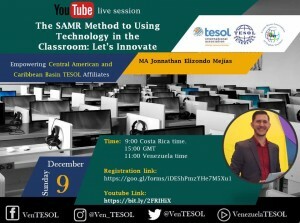 In this webinar, we will explore the method and tools that help us achieve our objectives as well as to analyze some of the benefits that technology brings to enhance our students’ learning process. Jonnathan Elizondo is an experienced Costa Rican EFL professional who devotes his time and energy seeking ways to enhance his students’ learning processes. He is especially interested in exploring the impact of technology in the English classroom and specifically in using ICTs to improve students’ language skills. Currently, this is the topic of his dissertation to obtain a PhD in Education from Universidad Internacional Iberoamericana (UNINI) in Mexico. Mr. Elizondo also holds an MA in Teaching English as a Foreign Language and a BA in Primary Education with emphasis in English teaching – both degrees from the University of Costa Rica. Jonnathan has experience teaching English to different age groups. At present he works as a teacher for the Ministry of Public Education, Professor at Universidad Estatal a Distancia, and as a Speaking Examiner for Cambridge English. Time: 9:00 Costa Rica time.